How to Grow Matches is a fiery retort to the silencing of women’s voices and bodies over the centuries. 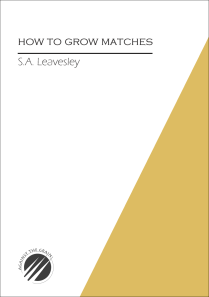 Despite the collection’s undercurrent of passionate rage against this injustice, Leavesley wields her power with the tightly controlled precision of surgeon. Each poem seems to spark and crackle with energy and not a line is out of place. I am reminded of Carol Ann Duffy’s 1999 collection The World’s Wife, as Leavesley tells and retells stories of old paintings, unknown female perspectives on political events and characters forgotten by history, continually harkening back to the fairy tales and mythology. Yet despite these old themes, this collection has a modern relevance. At a time of #MeToo and sexual harassment culture, the silencing of female voices feels all too ordinary. Yet hunger is not always powerful. In ‘The cow that ate all the plums,’ what at first seems to be a funny scene about a greedy animal, the cow’s hunger ‘for the lost plums’ becomes hunger in the eyes of a homeless person, ‘I’ve seen those eyes before, riding/the last metro, then hunkered down/ in a subway as wind shivers grey puddles/and the acid of lack slowly curdles.’ The ‘acid of lack’ lingers long in the reader’s mouth after reading, because it seems Leavesley sympathises with those ‘lost plums’, uncovering hidden voices and letting them speak. She deftly shifts from scene to scene, seamlessly weaving together the stories of a woman in a still life painting holding an orange, a foot-bound woman and a woman who has survived Soviet Russia in a way that feels natural and unforced. She allows the reader to enjoy peeling back the layers of each unknown story like a Matryoshka doll, with the female voice remaining in control of the telling. Her characters reclaim their share in their story, whether grappling with language in Territory or seizing a snatched moment of solitude before returning to the role of daughter and provider in First Thing. With this telling there is also a burning insistence on the need to be heard. The penultimate poem, All the women left, sharply satirises what the silencing of female voices will lead to: ‘the auditorium’s/ open mouth now missing half/ its teeth.’ Leavesley does not mince her words; How to Grow Matches demands to be read, without compromise. Yet it is when Leavesley’s satire is most modern and overt that she loses a little of her bite. American dream feels like a critique of modern consumerism which we have all heard many times before and phrases such as ‘profile pic’ in Publicity shots jar with the collection’s overall tone. However, this is a very small fly in Leavesley’s ointment. How to Grow Matches is a raging flare in the dark that commands our attention and refuses to be put out.